Worth $ 5000, the prize is given to "a candidate who stands out by the quality of his academic achievements and realisations, and by the influence of his study project on the advancement of the engineer profession and on society. " Supervised by professor Benoît Gosselin of the electrical and computer engineering department, and member of the Laboratoire de recherche sur les microsystèmes biomédicaux (LMBio-UL), Mr. Gagnon-Turcotte works on the development of an microchip optoelectronic system that can recreate artificial neuronal connections in the brains of transgenic animals. This technology will be used in studies on Alzheimer's using optogenetics and electrophysiology. 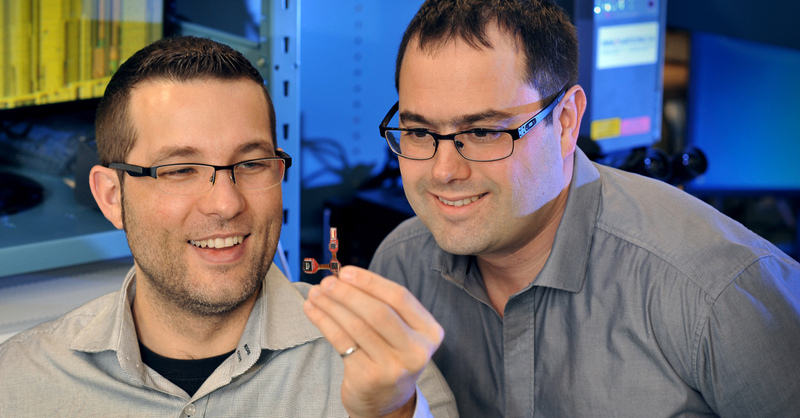 Mr. Gagnon-Turcotte's project is a collaboration with Yves De Koninck's group at the CERVO Brain Research Centre and the group of Younès Messaddeq at the Centre d'optique, photonique et laser (COPL) and the Canada Excellence Research Chair in Photonic Innovations. This approach will bring a better understanding of many brain illnesses, such as Alzheimer's and Parkinson's diseases, epilepsy, chronic pain; diseases whose prevalence increases with the aging of the population.